I attended a continuing education seminar the other day. It was a rare treat since I’m usually on the speaking side of continuing education engagements. I get most of my continuing education from online sources, reading my specialty society’s journal, and answering continuing ed quiz questions. The seminar I attended was put on by one of the local hospitals. It targeted physicians who have been using their EHR for some time, but who need tips and tricks to make documentation faster. A friend of mine was teaching the class and invited me to attend. She is relatively new to being a clinical informatics administrator, although she’s been an end user for a very long time. This was her first time teaching a “techy” class and she was looking for feedback on her delivery. She also wanted my opinion on whether she had prepared a good blend of clinically relevant information and technical suggestions. I’m not on staff at her hospital, but wanted to help her out. Not to mention it was an easy way to get CME while getting a sneak peek at their state of the art (aka “hundreds of millions of dollars”) system and hear feedback from users of a system I don’t usually work with. Physicians tend to think the grass is always greener on the other side of the fence. Being able to peek under the hood of another system usually shows that although the grass may be different, it’s not always greener. Many of the physician comments made during this class were the same ones I hear when working with users of other systems: not enough user-level configurability, alert fatigue, too many clicks, etc. Half the physicians in the room might love a particular features while the other half hate it. This group was no different. Some of the lines of disagreement split as anticipated, whether specialists vs. generalists or procedural specialties vs. cognitive specialties. My friend did a great job covering some of the nuances of the EHR. Whenever she covered an area where physicians were particularly struggling, she was not only able to show the best practice workflows, but often provided commentary on why the system was set up in a particular way or why a feature might or might not be enabled. Many of the attendees were in agreement that understanding the “why” behind a given feature can make it seem less clunky if it’s clear the benefits outweigh the annoyances of the workflow. This allowed for a lot of dialogue among the end users, the IT department, and the administrators. Usually I don’t see IT or administration attending sessions like this and it went a long way towards convincing the providers that their organization really does care what they think about the EHR and that they are committed to making the workflows as good as they can possibly be. It also allowed them to hear directly from the physicians without the help desk or a physician services liaison trying to translate or summarize the concerns. My friend did a fantastic job with her training. After the initial lecture portion of the class (which granted continuing education hours), there was a 45-minute lab time where trainers were available to work with attendees on particular workflows or sticking points. That way, any outstanding questions could be addressed immediately and the learners could also practice and solidify the new workflows they had used in class. She also incorporated hot button clinical issues into her examples, leading several of the providers to go in and update their order sets or modify their preferences accordingly. Having immediate lab time after the formal lecture is something that many workflow classes lack. Attendees are often excited about learning, but then have to go back to their department or patient care area and have difficulty finding the time needed to try new workflows in a protected environment or to update system configuration. It was also great having trainers to work one on one with attendees so that those who might have been struggling or had more questions knew that they would be able to get help and didn’t derail the rest of the class with questions. I met with my friend after and gave her a couple of ideas for changes to her presentation style as well as a heads-up about some speech habits that might be distracting to learners. As a clinician who was thrown into the administrative and training realm without a lot of formal support, I know that kind of feedback can be valuable. I have a mentor who sits in on some of my presentations from time to time and does the same thing for me and the advice I’ve received has been extremely valuable. Depending on the medical school and residency training program a physician attends, there may be solid presentation skills training or none at all. I remember my first presentation as a student, using overhead projector transparencies and a carousel projector. I may be dating myself, but that required a lot more advanced preparation to get slides organized and transparencies created. I definitely appreciate being able to throw together a presentation on the fly, but sometimes we lose the formality we had when we were lower tech. Hospitals that don’t offer this kind of ongoing EHR training and optimization sessions are short-changing their end users. They don’t always have to be this formal and with this many resources involved, but having them available to users on an ongoing basis (whether live or recorded) is critical to long-term success and user satisfaction. Does your hospital offer ongoing EHR training? Email me. Ha! 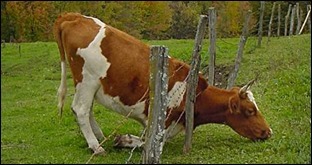 Having grown up on a farm, that cow-under-the-fence picture brings back memories. Our fences weren’t quite that rickety but the cows did the exact same thing. The grass always looks greener on the other side. Cows and humans have a great deal in common!